The Parabolic SAR is a versatile trading indicator which can be effectively used as a trailing stop indicator. It forms a kind of trend following strategy and works best when markets are in a strong trending mode. When combined with the Stochastics oscillator, which basically oscillate between overbought and oversold conditions, thus representing rising and falling momentum, the Parabolic SAR and Stochastics trading system can make for a very unique trading system in itself. This unique approach is further enhanced with a contrarian approach of using multiple time frames. Using the well known approach of using a higher time frame to determine trends, the MTF approach is rather simple. The chart set up is very simple and the Parabolic SAR as well as the stochastics oscillator comes as standard indicators in most of the popular charting or trading platforms. For the Parabolic SAR the default settings of 0.02 and 0.2 is used and for Stochastics, we make use of 14,5,5 or any other settings you may feel comfortable with and reflects closely the market’s peaks and troughs. The chart below shows how the chart set up looks like once the two indicators are added. The first step to trading with this method is to look to a higher time frame. Ideally, this system works best trading off the H4 charts, while looking for trend confirmation from the daily charts. In the chart below, we’ll focus on the periods between March – May to understand this trading system better. 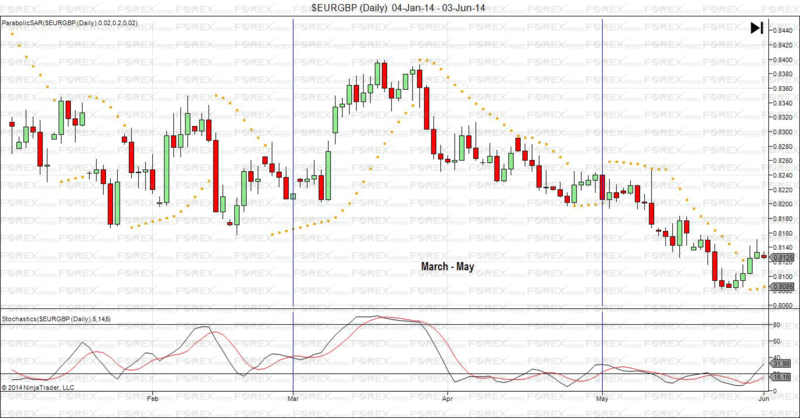 In the above chart, we notice that from the month of March onwards, we have an uptrend established on the daily charts. 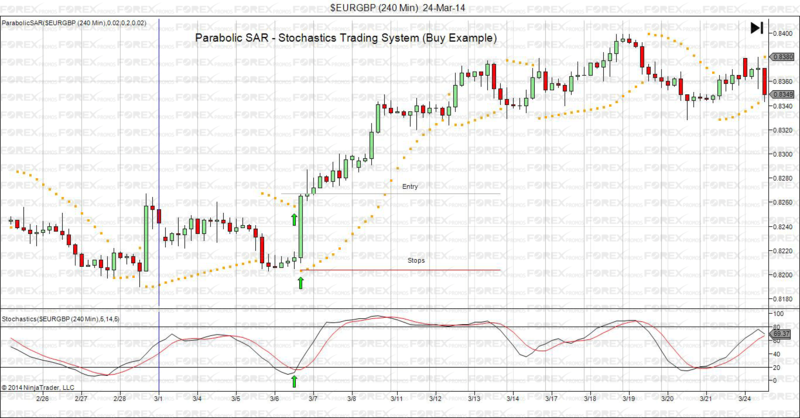 This is identified by the Parabolic SAR below price and the Stochastics previously rising from the oversold levels. On March 1st, we find price to be moving in an uptrend, so we scale back to the H4 charts, to pick the right buy conditions. The above chart shows how a long position was entered few days later on the H4 charts. We first see price breaking the Parabolic SAR on top. We also see the Stochastics making a bullish crossover. 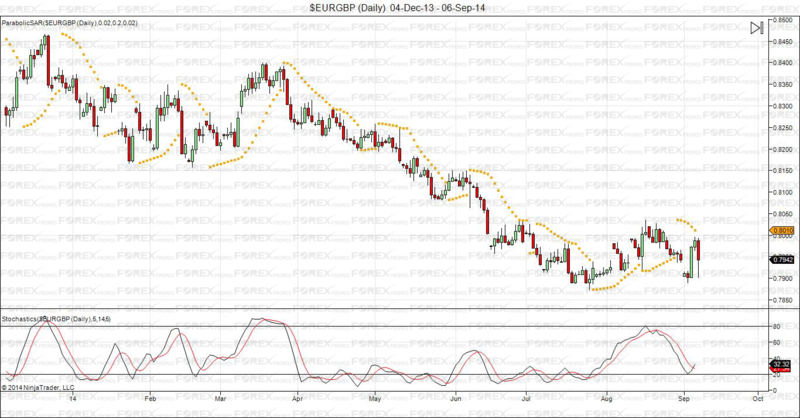 A buy trade is taken at the high of the candle, with stops set to the initial Parabolic SAR level. Stops can either be trailed or left alone while target price can be set to a 1:1 or 1:2 risk reward ratio. 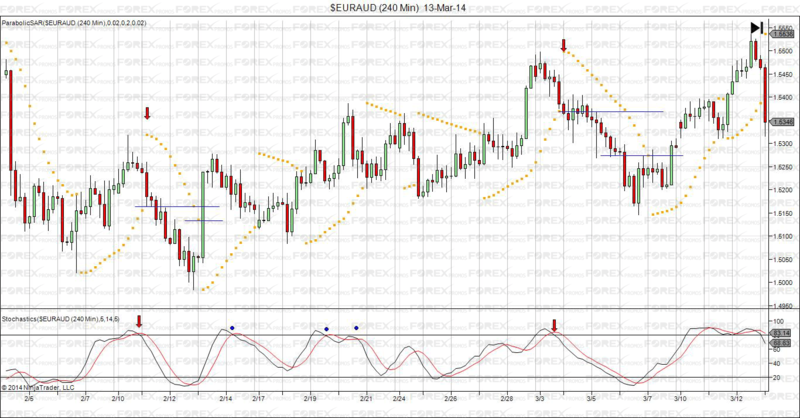 The chart below shows the EURAUD daily charts between the periods of February through April. We notice the perfect sell conditions set up here, with the parabolic SAR above price and the Stochastics oscillator recently making a bearish cross over. 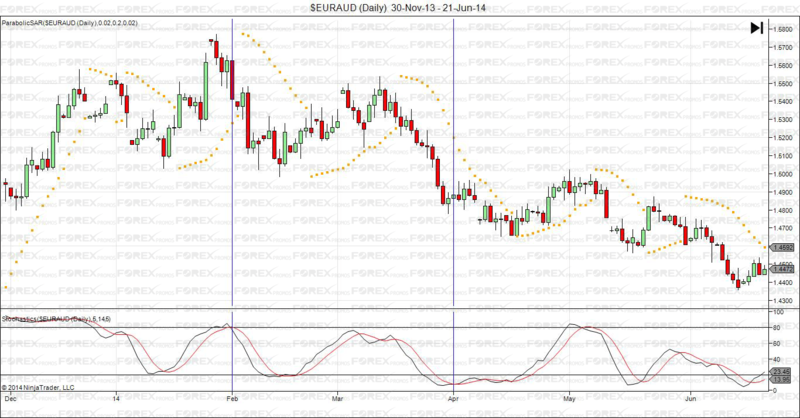 We then switch over to the H4 charts to look for the sell set up criteria to be filled in order to go short on EURAUD. The chart below shows how when the PSAR and Stochastics line up, we take short positions. The blue lines marked show the actual profits booked. The above system explained offers a very simplistic view of this trading method. It can be enhanced by trailing stops in the direction of the main trend from the higher time frame (the daily charts) to ensure that more pips are captured, while taking on the possibility of opening new trades as and when new signals appear on the lower time frame charts. This MTF approach ensures that the trades are taken in the direction of the trend while the Stochastics ensures the timing factor. It offers a low risk, high probability trading system by using the two standard technical indicators.